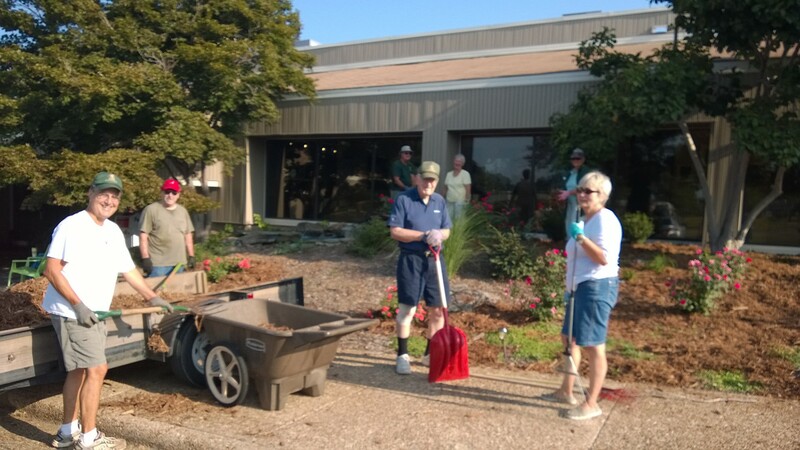 Early Saturday morning eight Cleburne County Master Gardeners set out to beat the heat and spruce up the Jr. Master Gardener site at West Side School. 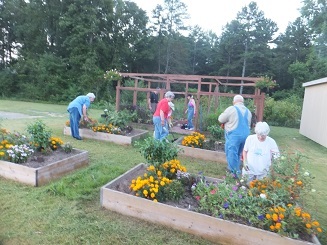 The four raised gardens were weeded deadheaded and cleaned up and the enclosed “Good Food Garden area was outfitted with soaker hoses in addition to weeding and a general clean-up. The crabgrass posed a particular challenge; but, for the most part, the Master Gardeners prevailed. A new irrigation system had to be laid out and installed to bring water to the site. The project was completed by 7:30 a.m., just as the sun was rising on the gardens. This was all in preparation for the new school year and the students arriving on Monday morning. The first Jr. Master Gardener classes will start on Wednesday, August 27. Pictured are (from left to right) Alice George, Hansel Walton, Mary Howard, Sandy Mills, Darlene O’Connor, Dub Mills and Carolyn Goettsch. The photo was taken by David Kuh. Van Buren County Master Gardeners refresh the mulch at the Conference Center. The project was funded by Alex Klepco’s Eagle Scout Project.